On 17 May, I was in Dubai to sign an agreement with Dubai SME, an agency of the Department of Economic Development (DED), to develop the angel investment ecosystem in Dubai. The agreement was signed immediately after the release of the ‘The State of SME Equity Financing in Dubai’ report, which was presented at the opening session of the first SME Equity Financing Forum at the Armada Hotel. The event also featured another important announcement: A Dubai Ventures Network will be launched to raise awareness of the importance of equity investment in SMEs, to create an ecosystem for equity investment in SMEs by involving all key players (angel investors, venture capital funds, SMEs, entrepreneurs, incubators, accelerators, universities, policymakers, and so on), to improve the capabilities of investors, and to facilitate and advocate for the development of a supportive regulatory framework for SME equity investment. The report stated that, in comparison to angel investment activity in Europe and USA, Dubai can be categorised as a relatively new market. Figures of the United Arab Emirates (Dubai in particular) give an idea about the dynamism of the early-stage investment market of the country. There are 200 visible angels in Dubai, 3 business angel networks with a total of 45 members. $2.3 million was invested in 2014 in 40 deals – which means individual investment per deal was about $65,000 (vs $37,000 per deal in the US and $26,000 in Europe). The average deal size is 20%, and 3,168 new jobs were created through angel investment in startups and SMEs. The expected increase in the number of industry-specific incubators and accelerators, triggered by strategic government investments, is likely to further boost a growth of startups within the economy. The UAE, particularly Dubai, has witnessed a lot of foreign interest from business angels in the US and Europe, which presents an opportunity to convert these into active investors focused on UAE-based businesses. ArabNet reports that the investor community in the MENA region is heavily concentrated in a few markets: the top five countries are home to more than 70% of all funding institutions surveyed. The UAE (27%), Saudi Arabia (16%) and Egypt (11%) are the region’s largest markets, and all rank in the top 5 countries in concentration of investors. There are also strong investor communities in the Levant region, including Lebanon (13%), Jordan (8%) and Palestine (6%). So the UAE, and especially Dubai, plays a crucial role in the early-stage investment market of the region. I think these figures show the potential in the region. Convincing an individual to invest in startups and SMEs is not so easy in the MENA region because in this region investment means investment in real estate, not the dream estate. But the decline in oil prices, I believe, has started to push the policymakers of the region to create an awareness of the early-stage investment market and its benefits. Since the main players of this market are startups and SMEs with ‘great dreams to change the world with innovative products’, institutions such as Dubai SME are key a mindset change in investors so that they can see the potential in startups, not only real estate. Figures of ArabNet and of Dubai SME are very compatible. When it comes to the number of deals by country, the UAE captures the lion’s share, with 137 deals in the past 3 years. This is roughly double the number of deals in the next biggest markets – Jordan, Lebanon, Egypt and Saudi Arabia – which hover around 60-70 deals each. Beyond these markets, some countries to watch out for are Tunisia, Palestine and Morocco, which have witnessed good deal flow and have the potential to grow rapidly. It is interesting to note that a number of MENA funds are investing actively outside the region, with almost 50 deals across the USA, Turkey and the UK, and deals in Africa (Ghana) and East Asia (China). UAE has the second largest economy in the GCC (after Saudi Arabia), with a gross domestic product (GDP) of $377 billion (1.38 trillion AED) in 2012. 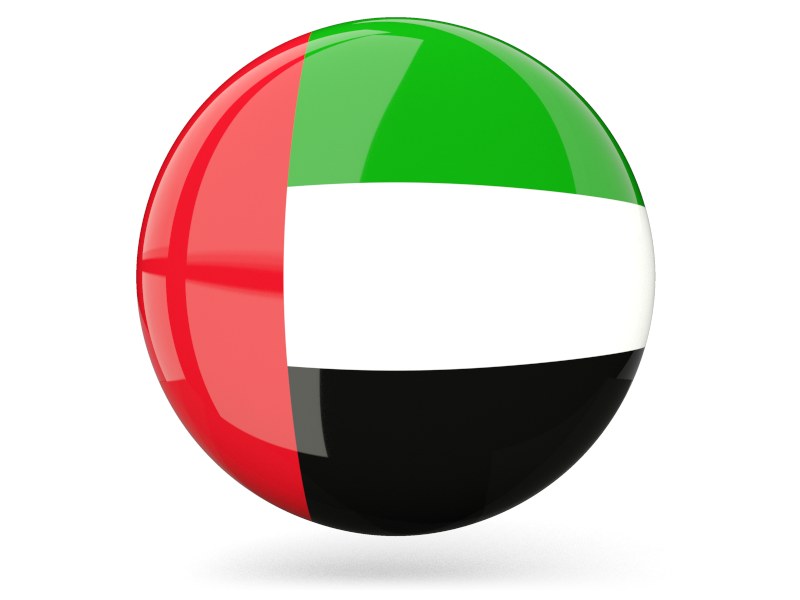 Since independence in 1971, UAE’s economy has grown by nearly 231 times to 1.45 trillion AED in 2013. The non-oil trade has grown to 1.2 trillion AED, a growth by around 28 times from 1981 to 2012. UAE is ranked as the 31st best nation in the world for doing business based on its economy and regulatory environment, ranked by the Doing Business 2016 Report published by the World Bank Group. Although UAE has the most diversified economy in the GCC, the UAE’s economy remains extremely reliant on oil. With the exception of Dubai, most of the UAE is dependent on oil revenues. Petroleum and natural gas continue to play a central role in the economy, especially in Abu Dhabi. More than 85% of the UAE’s economy was based on the oil exports in 2009. While Abu Dhabi and other UAE emirates have remained relatively conservative in their approach to diversification, Dubai, which has far smaller oil reserves, was bolder in its diversification policy. In 2011, oil exports accounted for 77% of the UAE’s state budget. Successful efforts at economic diversification have reduced the portion of GDP based on oil/gas output to 25%. Dubai suffered from a significant economic crisis in 2007–2010 and was bailed out by Abu Dhabi’s oil wealth. Dubai is running a balanced budget, reflecting economic growth. 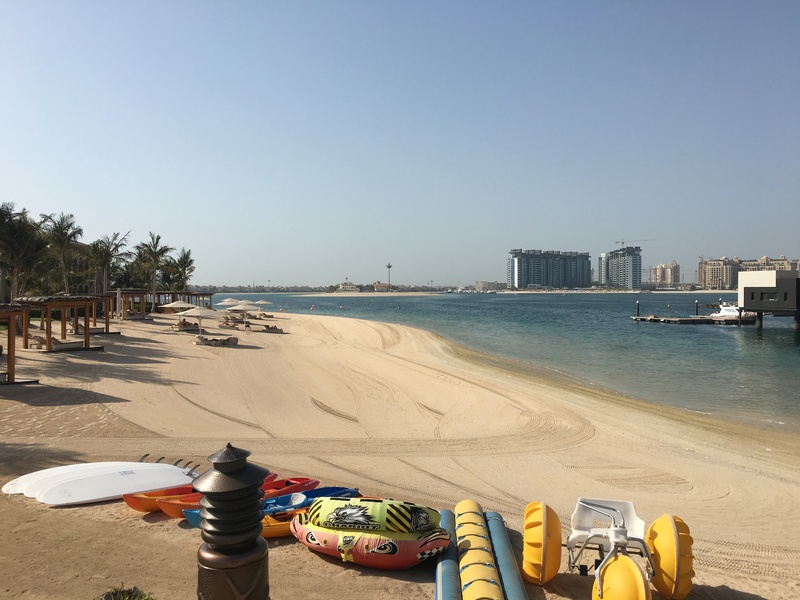 Tourism acts as a growth sector for the entire UAE economy. Dubai is the top tourism destination in the Middle East. According to the annual MasterCard Global Destination Cities Index, Dubai is the fifth most popular tourism destination in the world. Dubai holds up to 66% share of the UAE’s tourism economy, with Abu Dhabi having 16% and Sharjah 10%. Dubai welcomed 10 million tourists in 2013. The UAE has the most advanced and developed infrastructure in the region. Since the 1980s, the UAE has been spending billions of dollars on infrastructure. 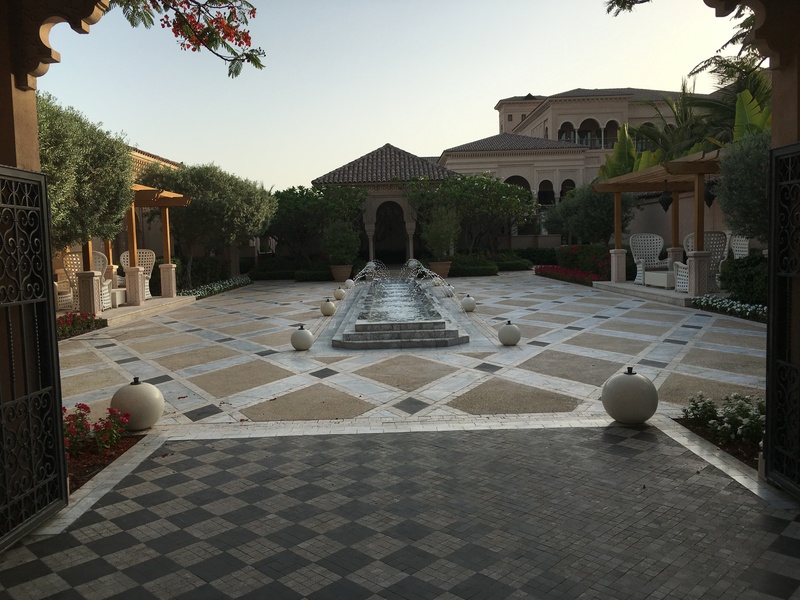 These developments are particularly evident in the larger emirates of Abu Dhabi and Dubai. The northern emirates are rapidly following suit, providing major incentives for developers of residential and commercial property. Ferrari World is located in Abu Dhabi. Property prices in Dubai fell dramatically when Dubai World, the government construction company, sought to delay a debt payment. The economy is depending on foreign labour force and Emiratization is only showing few positive effects which was found out in studies from Paul Dyer and Natasha Ridge from Dubai School of Government, Ingo Forstenlechner from United Arab Emirates University, Kasim Randaree from the British University of Dubai and Paul Knoglinger from the FHWien. On a positive note, according to a recent survey conducted by Bayt.com, 56% of professionals working in the UAE expect the economy to improve. One of the world’s fastest growing economies, Dubai’s gross domestic product is projected at USD 107.1 billion, with a growth rate of 6.1% in 2014. Although a number of core elements of Dubai’s trading infrastructure were built on the back of the oil industry, revenues from oil and natural gas account for less than 5% of the emirate’s revenues. It is estimated that Dubai produces 50,000 to 70,000 barrels (7,900 to 11,100 m3) of oil a day and substantial quantities of gas from offshore fields. The emirate’s share in the UAE’s total gas revenues is about 2%. Dubai’s oil reserves have diminished significantly and are expected to be exhausted in 20 years. Real estate and construction (22.6%), trade (16%), entrepôt (15%) and financial services (11%) are the largest contributors to Dubai’s economy. Dubai’s non-oil foreign trade stood at $362 billion in 2014. Of the overall trade volumes, imports had the biggest share with a value of $230 billion while exports and re-exports to the emirate stood at $31 billion and $101 billion respectively. By 2014, China had emerged as Dubai’s largest international trading partner, with a total of $47.7 billion in trade flows, up 29% from 2013. India was second among Dubai’s key trading partners with a trade of $29.7 billion, followed by the United States at $22.62 billion. The Kingdom of Saudi Arabia was Dubai’s fourth trading partner globally and first in the GCC and Arab world with a total trade value of $14.2 billion. Trade with Germany in 2014 totalled $12.3, Switzerland and Japan both at $11.72 billion and UK trade totalled $10.9 billion. Historically, Dubai and its twin across Dubai Creek, Deira (independent of Dubai City at that time), were important ports of call for Western manufacturers. Most of the new city’s banking and financial centres were headquartered in the port area. Dubai maintained its importance as a trade route through the 1970s and 1980s. Dubai has a free trade in gold and, until the 1990s, was the hub of a “brisk smuggling trade” of gold ingots to India, where gold import was restricted. Dubai’s Jebel Ali port, constructed in the 1970s, has the largest man-made harbour in the world and was ranked seventh globally for the volume of container traffic it supports. Dubai is also a hub for service industries such as information technology and finance, with industry-specific free zones throughout the city. Dubai Internet City, combined with Dubai Media City as part of TECOM (Dubai Technology, Electronic Commerce and Media Free Zone Authority), is one such enclave, whose members include IT firms such as Hewlett-Packard, EMC Corporation, Oracle Corporation, Microsoft, Dell and IBM, and media organisations such as MBC, CNN, BBC, Reuters, Sky News and AP. The government’s decision to diversify from a trade-based, oil-reliant economy to one that is service- and tourism-oriented made property more valuable, resulting in the property appreciation from 2004 to 2006. A longer-term assessment of Dubai’s property market, however, showed depreciation; some properties lost as much as 64% of their value from 2001 to November 2008.The large-scale real estate development projects have led to the construction of some of the tallest skyscrapers and largest projects in the world such as the Emirates Towers, the Burj Khalifa, the Palm Islands and the most expensive hotel, the Burj Al Arab.Dubai’s property market experienced a major downturn in 2008 and 2009 as a result of the slowing economic climate. By early 2009, the situation had worsened with the Great Recession taking a heavy toll on property values, construction and employment. This has had a major impact on property investors in the region, some of whom were unable to release funds from investments made in property developments. As of February 2009, Dubai’s foreign debt was estimated at approximately $80 billion, although this is a tiny fraction of the sovereign debt worldwide. Dubai real estate and UAE property experts believe that by avoiding the mistakes of the past, Dubai’s realty market can achieve stability in the future. Dubai is also known as the City of Gold, because a major part of the economy is based on gold trades, with Dubai’s total gold trading volumes in H1 2011 reaching 580 tonnes, with an average price of US$1,455 per troy ounce. A City Mayors survey ranked Dubai 44th among the world’s best financial cities in 2007, while another report by City Mayors indicated that Dubai was the world’s 27th richest city in 2012, in terms of purchasing power parity (PPP). 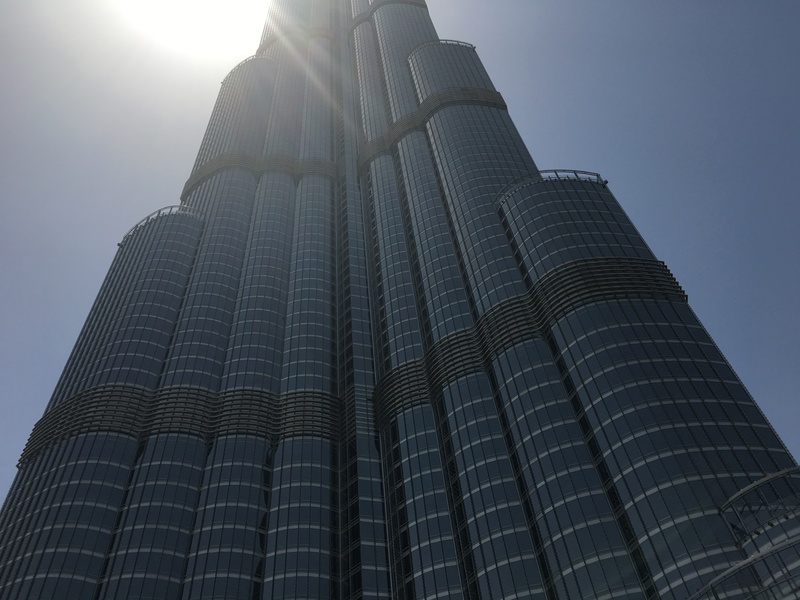 Dubai is also an international financial centre and has been ranked 37th within the top 50 global financial cities as surveyed by the MasterCard Worldwide Centres of Commerce Index (2007), and 1st within the Middle East. Established in 2002, Dubai SME was created as an integrated division of the Department of Economic Development (DED). It was developed as a resource for support, information and outreach for the growing small and medium enterprise sector. One of the major goals of Dubai SME is to promote innovation and leadership across all segments of the small and medium enterprise sector. Dubai SME, the agency of the Department of Economic Development (DED) in Dubai mandated to develop the small and medium enterprise (SME) sector, has launched a report on the ‘State of SME Equity Investment in Dubai,’ the first initiative of its kind in the Gulf region, to encourage investment in the sector and attract direct capital into areas with vast potential for entrepreneurial and start-up growth, from private equity (PE) investors, venture capitalists (VCs)and angel investors. The report was released during the first ‘SME Equity Financing Forum,’ organised by Dubai SME at the Armani Hotel, Dubai. Launched as part of the Dubai SME 2021 Strategic Plan, the report is well-aligned with the strategic economic direction of the UAE, particularly the focus of Dubai on innovation and investment towards building a knowledge economy. It also falls the first-ever authentic estimate on the market size, scope and potential impact of equity investment in SMES, in addition to overall state of equity investment in SMES across the UAE. The report provides for the first time a comprehensive picture of the state of investment in SMEs in Dubai, along with inputs from all stakeholders in SME equity financing, including entrepreneurs, investors, venture capitalists, legal institutions, SME development entities and academic institutions, as well as government organisations. 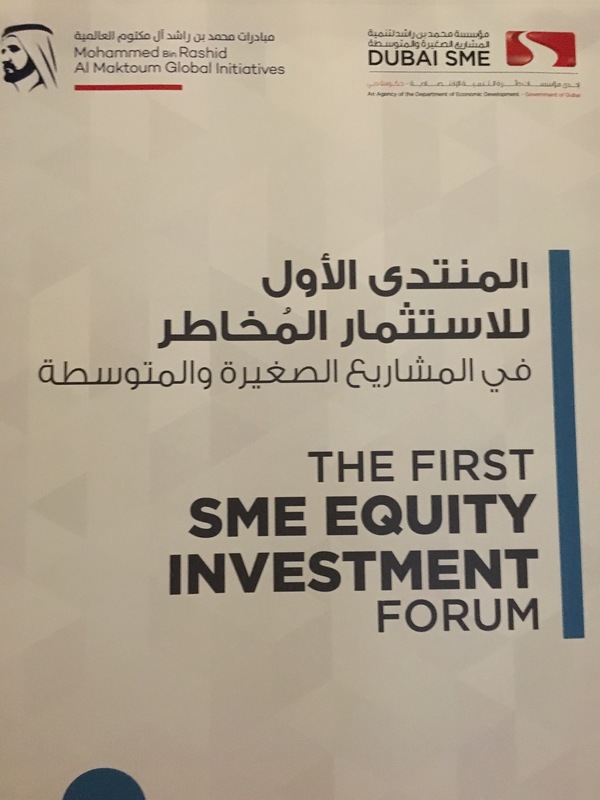 Dubai SME launched the Equity Investment Initiative in 2014 with the goal of unlocking investment and funding in SMEs and entrepreneurial projects. The equity investment landscape was studied in the first phase of the initiative and the recommendations in the report formed the basis of actions plans in the second phase. The second phase of the initiative will witness the launch of Dubai Ventures Network to raise awareness on the importance of equity investment in SMEs, to create an ecosystem for equity investment in SMEs by involving all key players (Angel Investors, Venture Capital Funds, SMEs, Entrepreneurs, incubators, accelerators, Universities, Policy Makers, .. etc), to improve capabilities of investors, and to facilitate and advocate developing a supportive regulatory framework for SME equity investment. 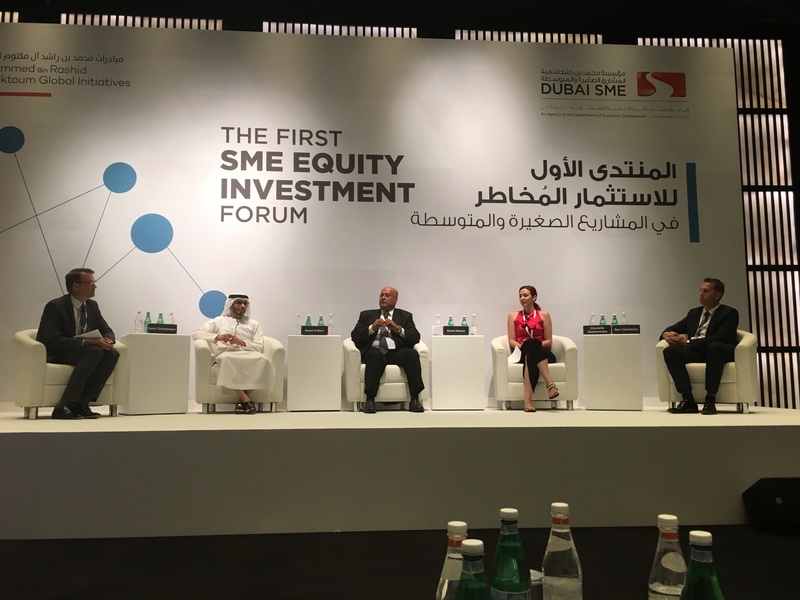 “The ‘State of SME Equity Investment’ report represents an ideal opportunity in the medium to long term, not only for SMEs in Dubai, but also for those across the region. The estimated total investment in small businesses in the region is about three billion dirhams, and with clear strategies these funds can be channelled into sectors of vast growth potential,” said His Excellency Sami Al Qamzi, Director General of DED. “However, limited source of funding to start businesses is a major gap in our SME ecosystem, which is underlined by the finding in the report that 80% of the start-ups relied on self-financing as a source of capital,” Al Qamzi said, adding that addressing market gaps and channelling investments into SMEs is critical to Dubai’s knowledge economy initiative. “Based on the findings in the report, Dubai SME has formulated strategies and initiatives to improve SME performance in the years ahead, facilitate SME access to financing, and enhance SME competitive as well as their value-add to the UAE economy,” he said. The report refers to the slow pace of innovation among SMEs in Dubai even when they have the potential to attract investment and remain growing. The presence of a strong institutional and legal framework to regulate investment activity is essential to improve investor confidence, unlock capital and attract investors, says the report. “Dubai SME has put in tremendous efforts into this report, which included a complete study of SME investment patterns across the project life cycle, from the establishment phase to expansion, as well as views and challenges related to the prevailing investment landscape. We will work on the recommendations in the report to fill the gaps identified, and promote equity financing, thus creating an environment conducive to SME growth and sustainable development in Dubai,” commented Abdul Baset Al Janahi, CEO of Dubai SME. Al Janahi said the Dubai SME has identified a number of potential initiatives based on the gaps identified in the report. Key initiatives have also been identified as a means of addressing the gaps mentioned as part of the Dubai SME 2021 Strategic Plan and they will be implemented in collaboration with key stakeholders in the entrepreneurial ecosystem. “The report has recommended raising awareness about the risks and benefits of investing in start-ups, highlighting SME success stories, facilitating communication between investors and start-ups, and promoting networking among various stakeholders such as business incubators, universities etc, among many others. Other recommendations include enabling investors to evaluate opportunities and SME potential, as well as building entrepreneurial capabilities in sourcing and negotiating investment,” Al Janahi said. The report calls for robust insolvency and bankruptcy regime for onshore companies in the UAE and exploring the option of a secondary market, which would allow small and mid-sized companies to list without complex regulatory pre-conditions related to corporate governance and accounting. A sponsor-supervised capital market model, which will allow an SME to be brought to list by a sponsor with expertise in corporate finance and regulatory compliance has also been suggested, in addition to allowing SMEs to raise capital up to a certain limit without significant regulatory burden. The report recommends that there should be international standards to help investors assess the feasibility of business ideas as well as investment options in infrastructure, eco-innovation, including technical centers and centres of excellence in research and development. Absence of authoritative trading benchmarks makes investors apprehensive of investing in business ideas and evaluating risks, says the report. The report noted that the total value of capital investments in SMEs across Dubai amounted to nearly AED110 million in 2014 and it is expected to grow by 15% in the near term on the back of a 30% growth in the number of deals, driven largely by activity from existing incubators/accelerators and early-stage investment firms. Additionally, the expected increase in the number of industry-specific incubators and accelerators, triggered by strategic government investments; is likely to further boost a growth of startups within the economy. The UAE, particularly Dubai, has witnessed a lot of foreign interest from business angels in the US and Europe, which presents an opportunity to convert these into active investors, focused on UAE-based businesses. 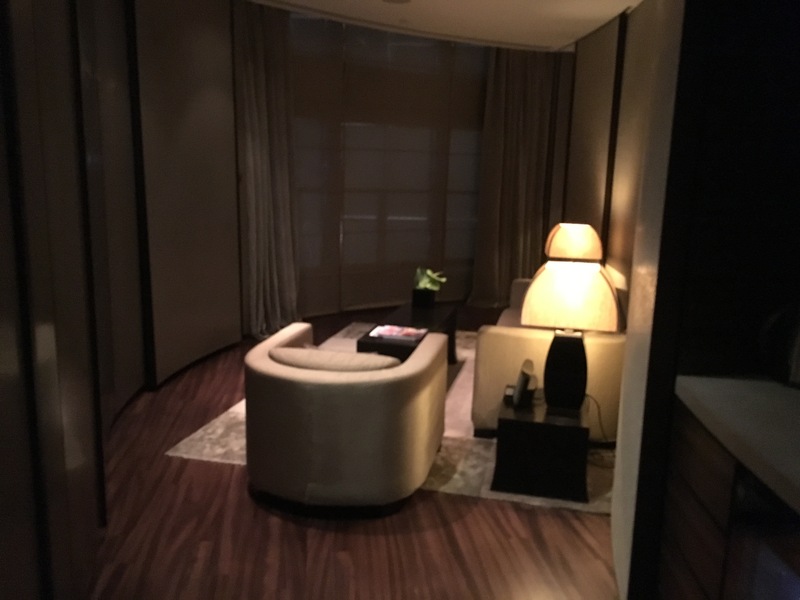 If you want to stay in the tallest building of the world and be close to the business district and the biggest shopping mall of the world, then Armani is a perfect choice. My suite was perfect. If you want to enjoy your dinner on the 122nd floor of the Armani Hotel, that is fine. But if you want to go a a bit higher to the 142nd floor and enjoy the view, you can expect to pay around $150. 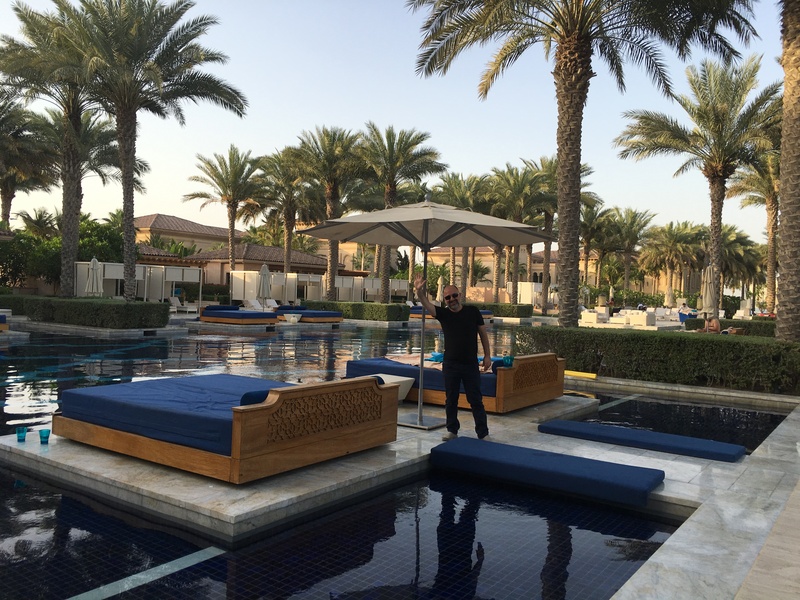 If you are travelling to Dubai for a holiday, my advice is to stay at the One & Only–The Palm Hotel. The only disadvantage of One & Only is that it takes more than 45 minutes by taxi in the rush hour to get downtown or to the Dubai Marina. I took the 7.25pm Emirates flight to Dubai from Istanbul Ataturk Airport. 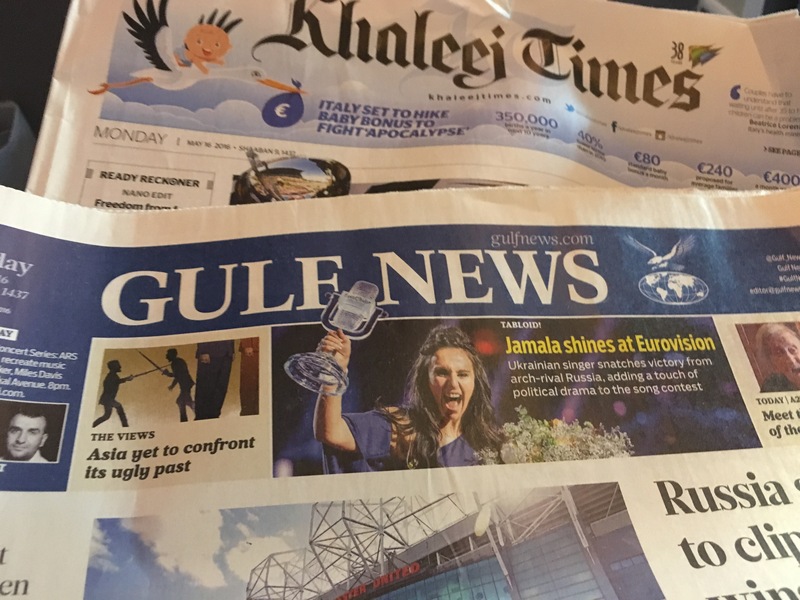 Because this was my first visit to Dubai (although I had heard many good things from my daughter, who had organised a business delegation from her university to Dubai a few months ago), I wanted to study a little bit about the country, so I did some research before getting on the flight. This trip also gave me an opportunity to experience the business class service of Emirates Airlines. In the last 5 years, to tell you the truth, because of the frequent flyer programme of Turkish Airlines (3 times more points if you fly business class), I always fly Turkish Airlines. They also have the advantage of direct flights to almost every country worldwide. 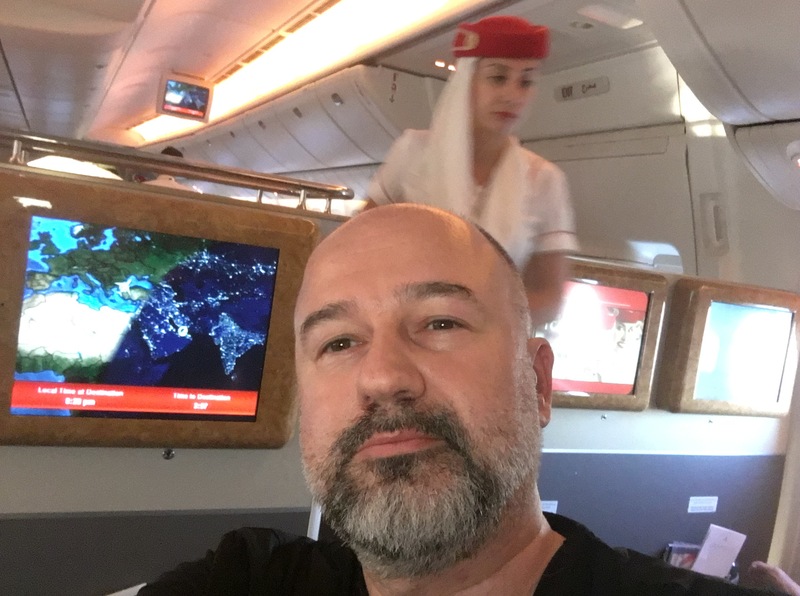 I had just recently experienced Khazahstan’s Astana Air and its business class and now I was going to experience Emirates and its business class. The Emirates CIP lounge at the Istanbul Airport is not as good as the Turkish Airlines CIP lounge. The seats on Emirates are infinitely more comfortable and relaxing than seats on Turkish Airlines. In Turkish Airlines business class, because of the uncomfortable seats, you need to get up and move around after about 2 hours to get relief from the aches and pains that the seats cause. That is not the case with Emirates. Even at the end of 5 hours, I didn’t feel the need to stand up. The selections in the music box of Emirates are much wider than the ones on Turkish Airlines. However, in a list of over 1,000 songs, I couldn’t find a single Turkish song. I think Emirates staff must be specially selected from different countries of the world, which increases customer satisfaction. The menu of Turkish Airlines is much better. The flight attendant uniforms of Emirates are unquestionably the best in the world. If you fly by Emirates to Dubai, you arrive at and departing from Terminal 2 which is used exclusively for Emirates flights. In short, if I am asked to choose between Turkish Airlines and Emirates, my choice is Emirates. I immediately filled out an application to join the Emirates frequent flyer programme, which means now another airline has come into my life. I think I will prefer flying to Lusaka at the end of June by Emirates instead of Turkish Airlines. The connections of Emirates are fine if you are flying to Africa or Asia. 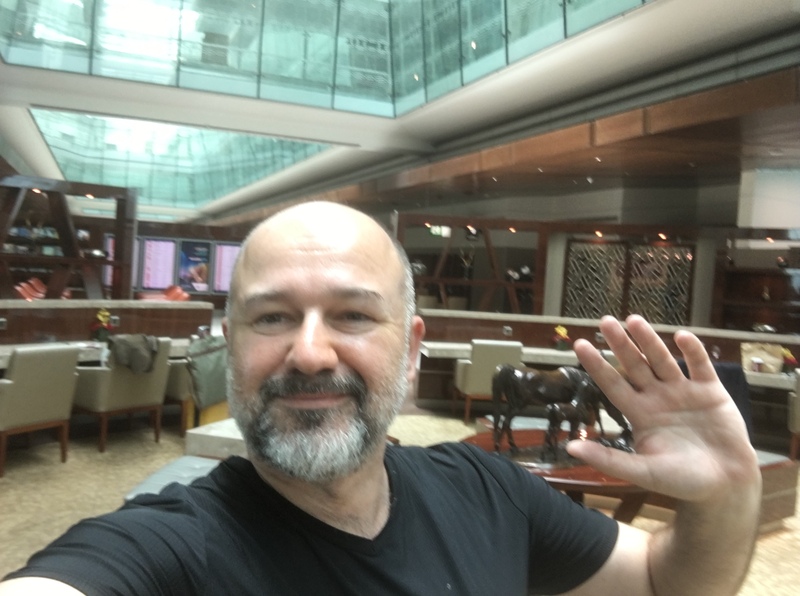 I arrived at the Dubai Airport about 1am after a very nice flight from Istanbul. 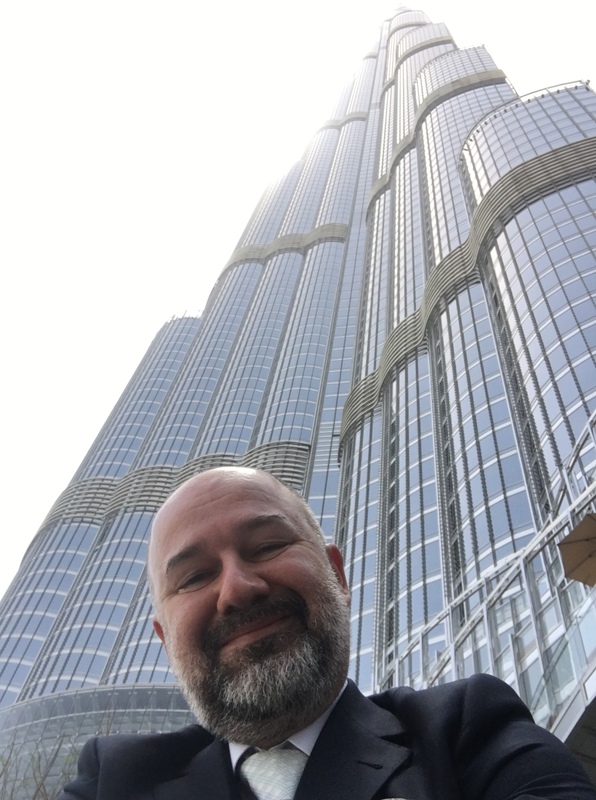 Because I already had my visa (sent by SME Dubai before the trip), it didn’t take much time to pass through the passport control and meet up with my chauffeur. 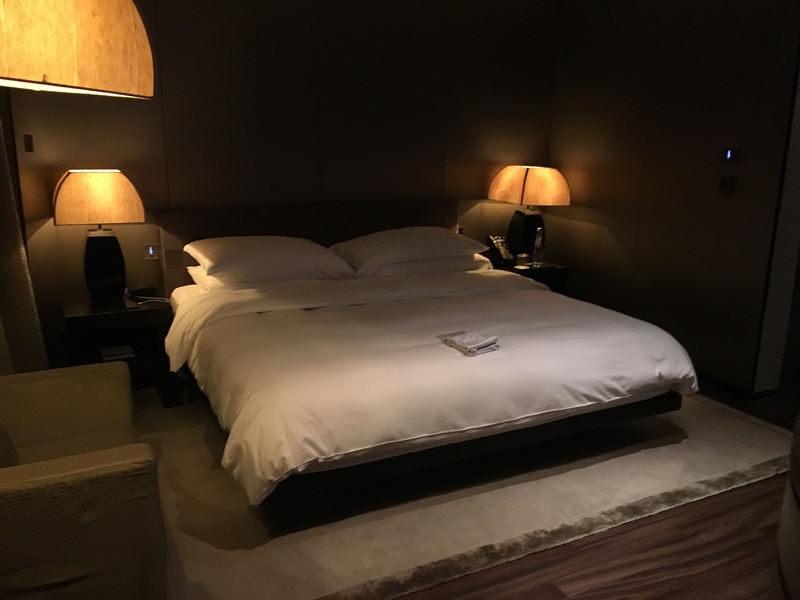 I was at the hotel around 2am and it was a nice surprise to hear that I was to be upgraded to a exclusive suite. It was now time to sleep if I was going to be fresh for the morning’s programme. I was ready at the lounge to leave for the first SME Equity Investment Forum by 9am at the convention centre of the Armada Hotel. After meeting and talking with H.E. 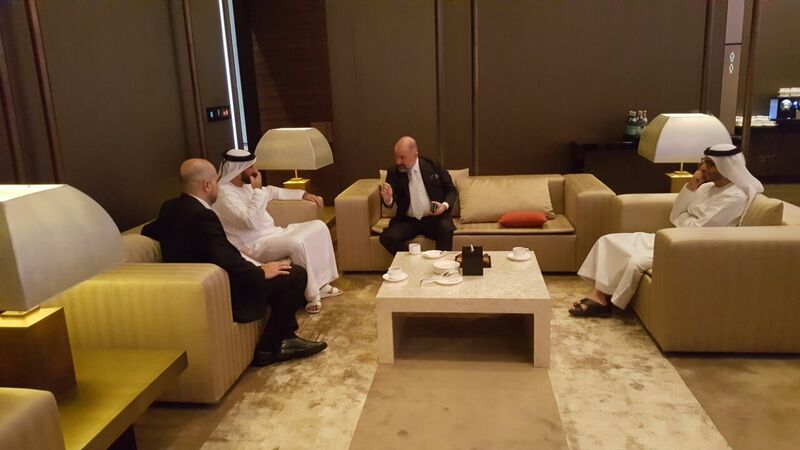 Sami Al Qamzi, Director General of the Dubai Department of the Economic Development, and with H.E. Abdul Baset Mohemmed Al Janahi, CEO of Dubai SME for about half an hour, we moved to the main room for the opening of the forum. After welcome remarks by H.E. Sami Dhaen Al Qamzi, H.E. 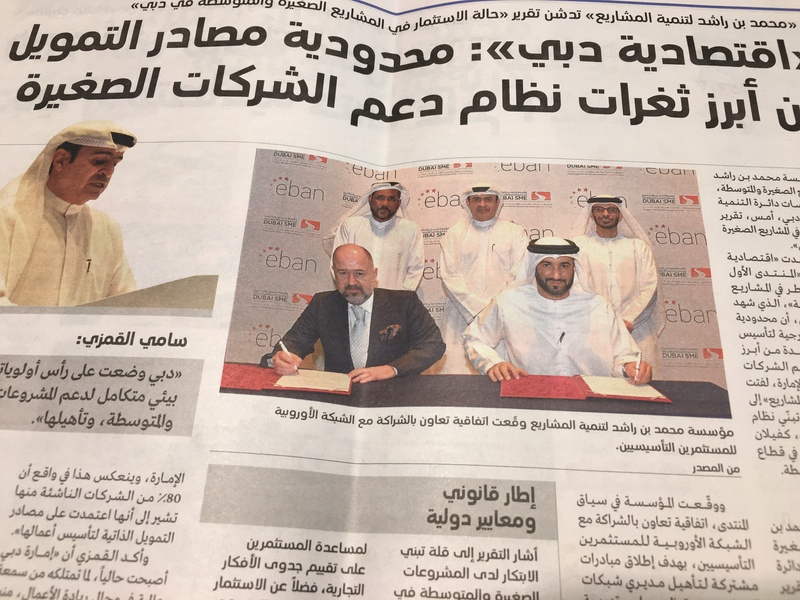 Abdul Baset Mohemmed Al Janahi presented the ‘State of SME Equity Financing in Dubai’ report, after which we signed a cooperation agreement between EBAN and Dubai SME. Then we listened to the first panel on SME equity investment in Dubai, where opportunities and areas to improve were discussed, and where I was able to listen to the remarks of Kamal Hassan, Founder and CEO of Innovation 360. After the panel, it was time for networking and chatting with local stakeholders. Following a coffee break, a second panel was waiting for us: Investment Success Stories. After that panel, I enjoyed talking to entrepreneurs and investors during the lunch break, when I was also interviewed by Andrew Scott of The National newspaper and met with an excellent entrepreneur, Rabih Mahfouz. I immediately downloaded the application and started to use it. I think you will also enjoy the unique services you can access using this application. As you know, angel investors who invest in a jockey also look at the horse. If both are good, they decide to invest. The demo is ready and working. The jockey is excellent (Rabih Mahfouz). The horse seems good (Imoshen). 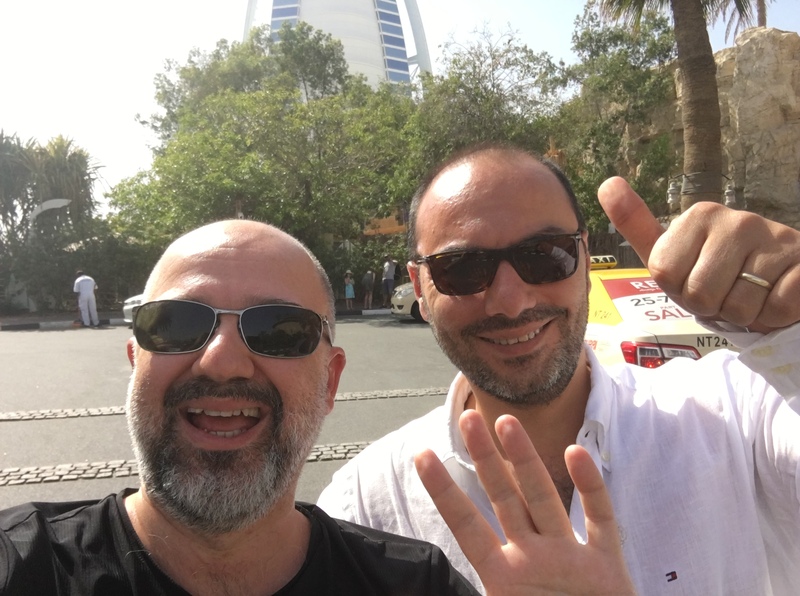 From 3pm to 9pm, Rabih showed me great hospitality and took me on a superb sightseeing tour of Dubai. The best part of our day was the coffee break at the One & Only Hotel. The second best part was the Marina, where I saw many restaurants from Turkey. One of them (Big Chefs) is owned by my dragon friend in Turkey. As you may know, I was one of the five dragons of the Dragons’ Den on Bloomberg TV in Turkey. After enjoying ice cream at the marina, we decided to go back to the hotel so that I could take my allergy pill. But because the rush hour traffic was so congested, I decided instead to invite Rabih for a pizza at the shopping mall next to my hotel. After all, I had already missed the timing of the pill. 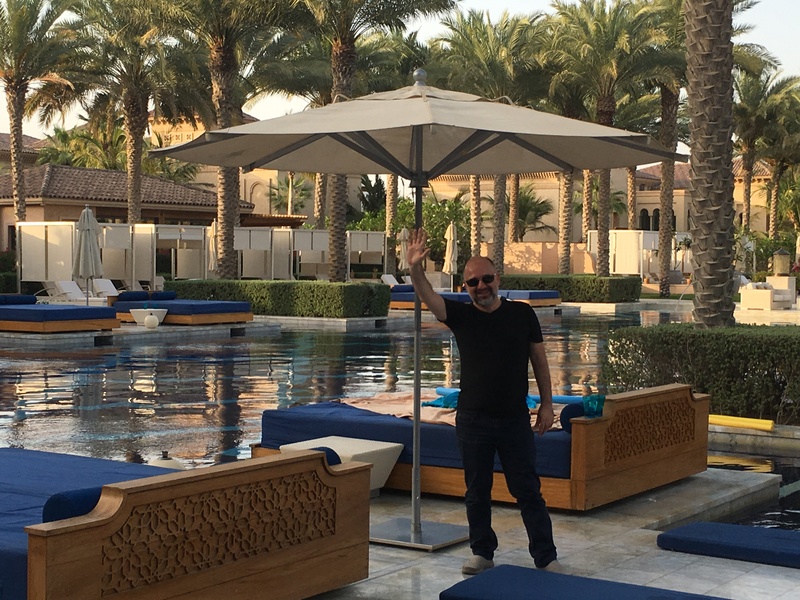 After enjoying the fascinating choreographed fountains and our super pizzas, it was time to say good-bye to Rabih Mahfouz. I was in bed around 10.30pm. 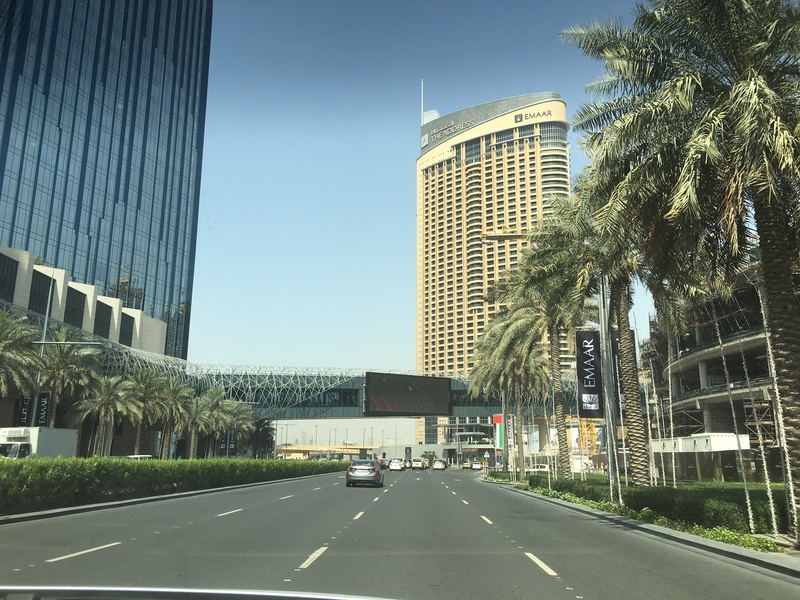 I had a nice breakfast at the hotel, after which Alan Mclver of Thomson Reuters collected me from the hotel at 8am to go to the meeting with Alan’s team members on SME scoring at Thomson Reuter’s Dubai centre. SME Scoring is a personal interest of mine and I observe that there is not yet any proven successful entity in the world that has developed a valid, objective and reliable tool to assess SMEs. The meeting lasted until 10 30am, and I think it was a beneficial one for the Thomson Reuters team. 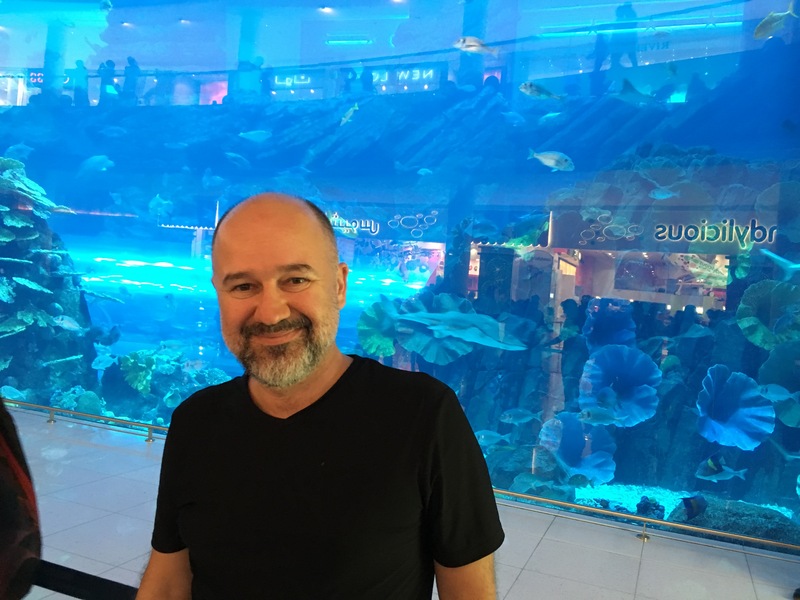 Then I was taken back to the hotel, and the chauffer that had been scheduled for 11 30am drove me to the airport, where I proceeded with my check-in procedures for the 2.15pm flight to Istanbul. 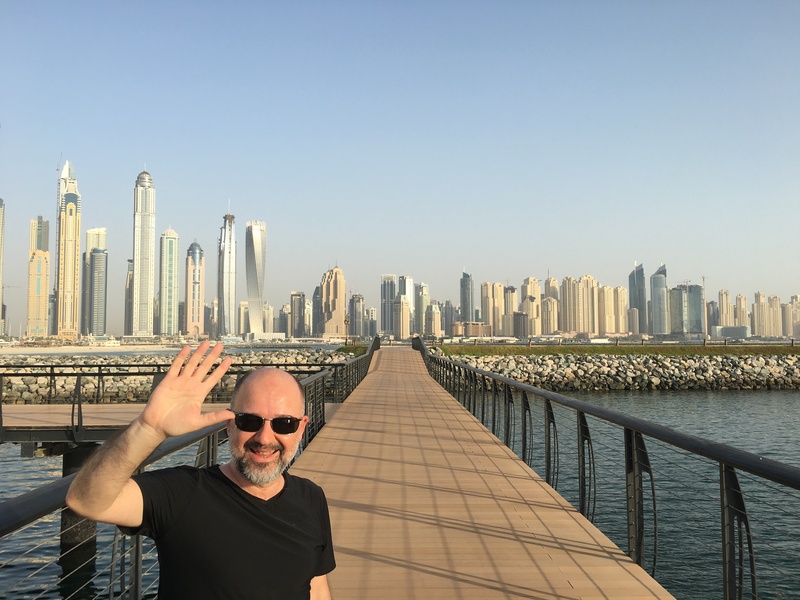 After a welcome break at the Emirates CIP Lounge at the Dubai Airport, it was time to say good-bye to this beautiful city and its hospitable people. Many thanks to H.E. Sami Al Qamzi, H.E. Abdul Baset Mohemmed Al Janahi, dear Saeed Matar Al Marri, dear Essam Disi and all the Dubai SME team for everything!